UPDATED: Sat., Aug. 11, 2018, 9:10 p.m.
Stefanos Tsitsipas, Greece, def. Kevin Anderson (4), South Africa, 6-7 (4), 6-4, 7-6 (7). Rafael Nadal (1), Spain, def. Karen Khachanov, Russia, 7-6 (3), 6-4. Raven Klaasen, South Africa, and Michael Venus, New Zealand, def. Oliver Marach, Austria, and Mate Pavic (1), Croatia, 4-6, 7-6 (5), 10-3. Henri Kontinen, Finland, and John Peers (2), Australia, def. Nikola Mektic, Croatia, and Alexander Peya, Austria, 7-6 (2), 4-6, 12-10. 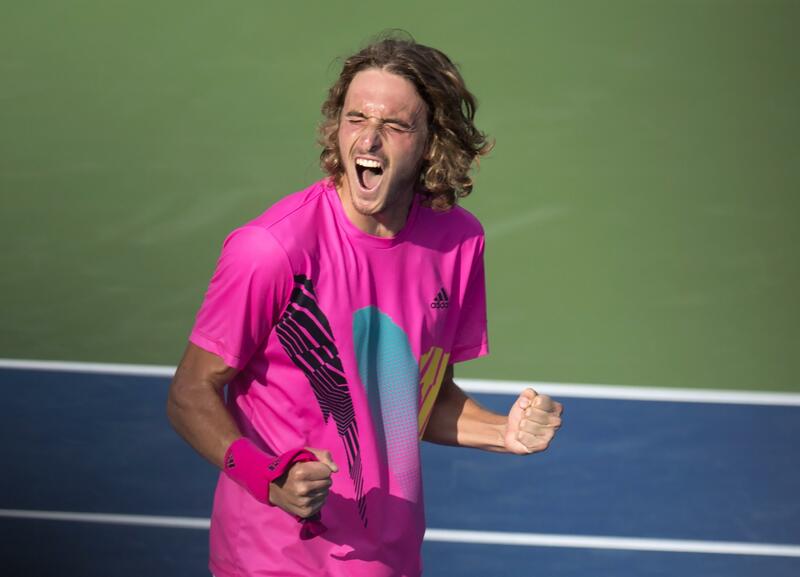 TORONTO – Greek teen Stefanos Tsitsipas became the youngest player to beat four straight top-10 players in an event since the ATP World Tour was established in 1990, outlasting Kevin Anderson 6-7 (4), 6-4, 7-6 (7) on Saturday to reach the Rogers Cup final. Tsitsipas will celebrate his 20th birthday Sunday by facing top-ranked Rafael Nadal in a bid for his first tour title. Nadal, chasing his 80th tour title, beat Karen Khachanov 7-6 (3), 6-4 in the rain-delayed night match that ended after midnight. Nadal has four titles this year, all on clay at the French Open, Monte Carlo, Barcelona and Rome. The 32-year-old Spanish star beat Tsitsipas in April in the Barcelona final in their only meeting. Tsitsipas beat the fourth-seeded Anderson after topping seventh-seeded Dominic Thiem, ninth-seeded Novak Djokovic and second-seeded defending champion Alexander Zverev. “I’m capable of doing anything on the court and beating any opponent,” Tsitsipas said. Tsitsipas fired an ace for an 8-7 lead and converted his third match point when Anderson’s return sailed long. The South African had a match point of his own at 7-6, but Tsitsipas came through with a brilliant backhand crosscourt winner to pull even. The 32-year-old Anderson reached the Wimbledon final last month. He also lost his only other match against Tsitsipas, falling this year on clay in Portugal. Tsitsipas is attempting to become the first player since Albert Portas at Hamburg in 2001 to win his first ATP World Tour title at a Masters 1000 event. Ranked 27th, Tsitsipas will jump to 12th with a victory Sunday and to 15th with a loss when the new rankings are released Monday. Published: Aug. 11, 2018, 3:34 p.m. Updated: Aug. 11, 2018, 9:10 p.m.